A new Census analysis shows Illinois leads the nation in population loss. The U-S Census updates its population numbers every year by looking at government documents like tax returns as well as birth and death records. 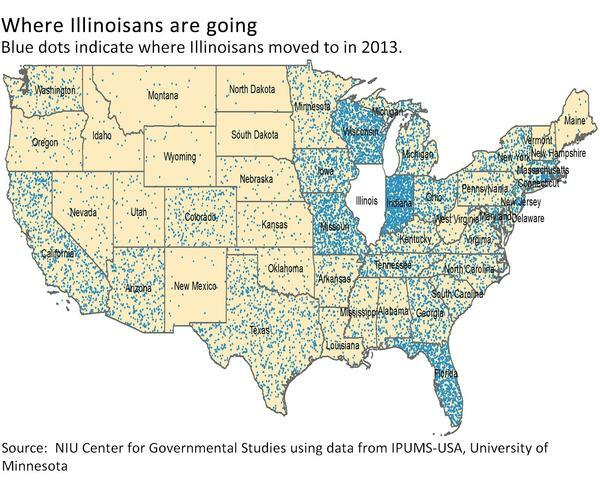 Illinois lost 22-thousand people over the past year. That’s like losing a city the size of Freeport in just one year. Sherrie Taylor is a research associate for Northern Illinois University. She says to put the loss in perspective, that’s 0.2% of the state’s population. She says there will be interesting breakdowns of those numbers by race, gender, and other factors in June. She says Illinois is definitely changing, and she saw that in last year’s numbers. You can see the vast majority of those leaving are whites and a lot of blacks. The Hispanics, because there are so many of them moving into the state, it kind of masks what’s going on underneath. Taylor says the state lost another ten thousand residents the year before. In analyzing those numbers, Taylor saw big population losses in border communities like Rockford, Lake County, and the Quad Cities. However, right across the border all those cities are gaining in population. That seems to indicate to me that people are possibly maintaining their job in Illinois but possibly hopping across the border to escape higher property taxes. But it’s hard to tell. Taylor says last year’s numbers also showed Illinoisans were moving to neighboring states in general. She says that could be for a lot of different reasons…but certainly not for the weather. Taylor says there’s more useful information to come from this week’s analysis: she expects county numbers in March and breakdowns by factors such as ethnicity and age in June. Copyright 2015 WNIJ-FM. To see more, visit WNIJ-FM. Carl Sandburg College President Lori Sundberg told members of the Illinois House that the state budget impasse is hurting the western Illinois college and its students. The city received some much anticipated news: the Illinois Secretary of State’s office has certified the results of the special census.